The Mitch Morgan Shot. The looks are not decieving. Take your favorite bourbon whiskey beverage, such as Jim Beam, chill if necessary in a shaker filled with ice. Smear bacon fat, if desired, on the rim of your shot glass. Fill shot glass with whiskey. 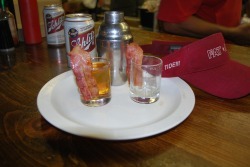 Take a cooked piece of bacon, buttefly and place over the rim of the shot glass. Some folks eat the bacon first, some split it in half and chew on the bacon, drink shot and chase it with bacon, some eat bacon last. Your choice. Enjoy. Repeat.